Back when I worked in Restaurant Land, I started thinking of each month in terms of specific ingredients. I remember one March having a pasta dish with fiddlehead ferns, truffles, and white asparagus. Another thing that comes with spring - rhubarb! This might sound crazy, since rhubarb is somewhat of an old-fashioned "fruit" (more of a vegetable really), but I had never had it before. Not once. 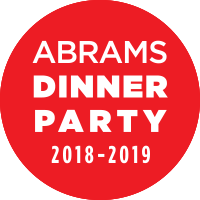 Not even in something else, like a strawberry-rhubarb pie. So I did a little research and recipe searching. I found that rhubarb is also known as "pie plant" in some parts of the country. In my recipe searching, I found a lot of recipes where rhubarb is used as a secondary ingredient, but not a lot where you could taste it on its own. Since this was my first rhubarb experience, I wanted something truly rhubarbesque. Enter the trusty old Betty Crocker cookbook. Sometimes, especially for traditional or old-fashioned recipes, you just have to use the cookbook you were raised on. For some people it's Joy of Cooking, for me it was Betty Crocker. In fact, my Mom had two - the "old" version and the "new," because the older one had recipes that were left out of the update. Her "new" was several versions before my new. All I did was follow the suggestions in converting apple crisp to rhubarb crisp, which was basically swapping out the fruit for equal amounts. The best part of my rhubarb experience was in preparing the rhubarb. How can something so much like celery be in a dessert? It looks like celery, you clean it like you clean celery, when you cut it it crunches like celery.... I felt like I was in some kind of science fiction novel where nothing was as it seemed. After it cooks it turns into a pale pink, and the sugar from the topping cooks down into the fruit. Cooking it softens it, but it doesn't entirely lose its slight tartness, a characteristic that I really enjoyed. The tart paired with the sweet crumbly crips was a match made in heaven. 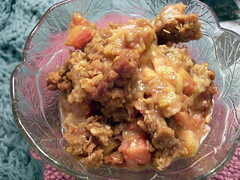 Peach or apple crisp might prove too sweet in the future, because I have had rhubarb crisp! I'm not including a recipe - just use your favorite crisp recipe and substitute equal amounts rhubarb. Or try half n' half. I really want to try blackberry rhubarb, for some reason. Or pear and rhubarb.